ROARING FORTIES™ RL100 series are approved to AS 4758 & ISO 12402-4. They are light in air & in water. Hence it is comfortable to wear them for longer periods. It will also provide a high & safe freeboard in water (ie. the vertical distance between the mouth & the surface of the water). 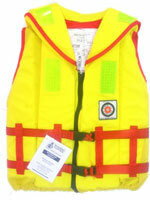 Our RL100 series PFDS will right a person in a safe inclined angle. By using a specialised uncoated warp knit polyester fabric, ROARING FORTIES™ RL100 series PFDs has excellent permeability of water in and out of the fabric & thus providing stability in performance & consistency in buoyancy. Our fabric has a colour fastness to light reading of 4-5 on a Blue Wool Standard & colour fastness to seawater reading of 4-5 on a grey scale. With these inherent features, ROARING FORTIES™ RL100 series PFDs perform much better than others when exposed to the above conditions. Apart from fungus resistant, Roaring Forties™ fabric has more resistance to chlorine attack than the average fabric. Thus the safety colour of our fabric is maintained for a longer period. This is one the reasons our PFDS are favoured by the swimming pools operators. 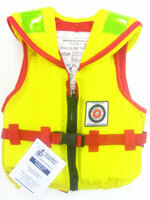 PFD Type 1 has a collar and has also a higher buoyancy rating than a PFD 2 or 3. It is generally used for yachting & other general boating activities. 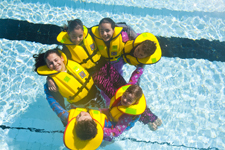 ROARING FORTIES™ RL100 series PFD Type 1 for Children & Adult is designed and manufactured to be light and comfortable to wear. This is a very imortant aspect to consider especially when you may have to wear it for the duration of your activity. It has stretchable sides to mould the shape of your body. The zip, crutch strap (optional for some sizes)) and strap buckle system, are designed to hold the PFD securely to the body. Available in 3 different sizes for children & 5 different sizes for adults.